Why birthday boxes are big wins - for everyone. However, creating a Birthday Box for your child is AMAZING. Why? Your child can have a ton of fun filling a box with items s/he likes - but you retain veto rights. Parents of your child's party guests have confidence in knowing the gift they select is something your child is eager to receive AND has been approved by you. ​Your child's box is posted on our website. So guests or out-of-town family can call the store or email us to have a gift wrapped from your child's box in advance of pick-up. YOU earn 1 loyalty reward point for every $2 purchased out of your child's box. 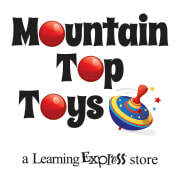 So get the word out to your party guests that your child has a birthday bin at Mountain Top Toys! 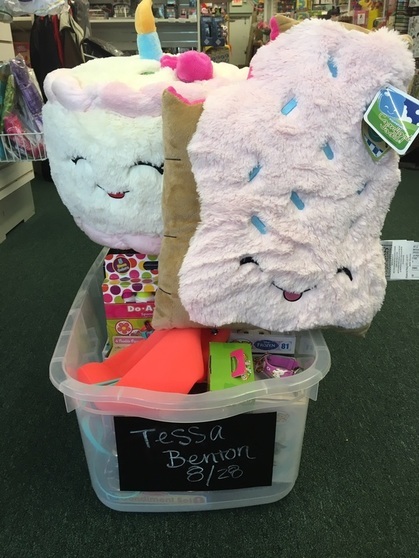 The number one question we're asked in our store is, "Does my child's friend have a birthday box?" And when the answer is, "Yes!" there is dancing and celebrating. When the answer is, "No, we're sorry..." there are slumped shoulders, loud, audible sighs, occasional misty eyes, and we think one time gnashing of teeth. (And this is from parents!) We're here to help them find a great gift, of course, but for those parents who come in our store at the last moment, we don't always have the staff available to take everyone around the store. So a birthday box is like giving all those parents the ultimate party favor.